As a young boy, my dad and I spent many hours tinkering under the hood of various cars in the driveway. It seemed like my dad always had a project going! From changing the oil, to doing a complete rebuild on the engine, we did it all; and I was hooked. As time went on, I was lucky enough to turn my favorite hobby into a career. I became owner of Kimmer Transmission & Gear , my Parker transmission repair shop in 1984. Since that time, I have built a team of expert mechanics that can handle most auto repairs, but specialize in transmission repairs and transmission rebuilds, in both foreign and domestic cars. I decided to put this page together, because I believe in empowering our customers through education, so that they may make good choices. I hope you’ll find it useful. Oftentimes, when a customer first comes in, he/she is very unfamiliar with what a is and how it works. Read more on what a transmission is. Perhaps the simplest explanation is this: A transmission allows power to be sent from a power source, most often an engine or motor, to a drive mechanism. Transmissions use gears and a clutch to convert the speed of the power source into torque. 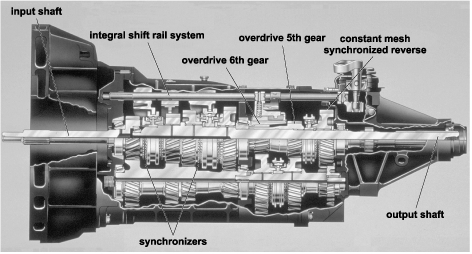 A simpler transmission is often referred to as a gearbox since it is basically a box containing a configuration of gears. What does a transmission look like? There are two types - automatic transmissions and manual transmissions. Check out other great images of transmissions. Learn more about the warning signs of transmission problems. We are happy to answer your questions about transmissions or transmission repairs. Call or visit our transmission repair Parker shop today. We are easily accessible from much of the Denver-metro area, as we are located right where Centennial, Aurora and Parker intersect. If you would like further information about transmissions or transmission repairs, call or visit our transmission repair Parker shop today. We are easily accessible from much of the Denver-metro area, as we are located right where Centennial, Aurora and Parker intersect.